The word "baptism" means "to immerse." 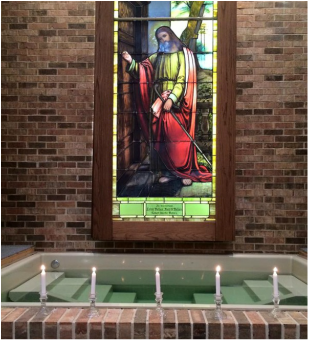 ​The Church on Northland practices baptism by immersion, what the Bible depicts, to symbolize being buried with Christ and rising to new life. Baptism is the next step in your spiritual journey AFTER you have decided to follow and put your trust in Jesus. Your infant baptism was certainly a very special moment for your family. Instead of baptizing infants, we dedicate our infants/children during a special occasion called "Child Dedication". In the Bible every baptism recorded occurs when someone makes a faith decision and is publicly displaying their faith. As a result, we believe that once you have decided to be a follower of Christ, baptism is your next step. You can certainly get re-baptized as an act of worship and obedience to Christ. The very word “baptism” means “to immerse.” That’s what the Bible records. We believes that if you’re physically able, you should get completely immersed. Can I invite my family & friends? Absolutely! Baptism at The Church on Northland is a celebration and is bound to be one of the highlights of your life as a Christian. Invite family and friends to join you on this special day as you publicly declare your faith and step forward into your new life, and don’t forget to capture this celebration by bringing your camera! The Pastor typically will do the baptizing, however if you have a family member, mentor, friend etc. who you would like to have baptize you, please let us know so we can discuss those details. If you've put your faith and trust in Jesus and are a follower of Christ, baptism may be the next step in your faith journey. Baptism does not save you, but it is the public picture of the private work God has done within you.